Recently Delta-Phase delivered and installed a phenol measurement system for a chemical plant in Singapore. The plant produces inks and has a need to treat their waste process water with an activated carbon filtration system. The Delta-Phase monitoring system based on the FA7-OW and PH7 sensors is used to monitor for phenol, an organic pollutant byproduct in the ink manufacturing process. The system is working well and the results correlate with colorimetric grab sample methods. Figure 1 shows the installation of the bypass flow cells and GDC general display controllers. Figure 1. 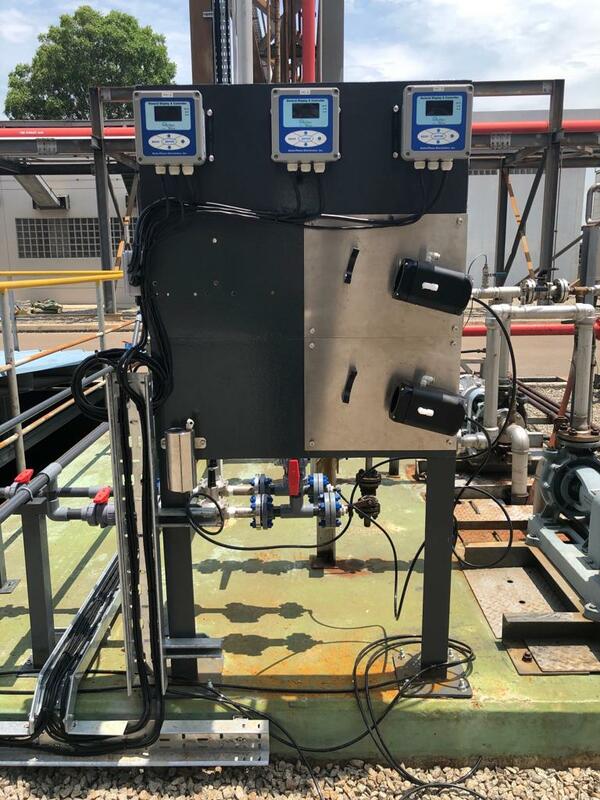 Installation of Delta-Phase FA7-OW, PH7, bypass flow cells, and GDC-02 for phenol monitoring at Singapore chemical plant.